color woodblock print, Library of Congress, courtesy of Wikipedia. In the aftermath of the recent disasters in Japan, I found this BBC video about Japanese artist Katsushika Hokusai's iconic print, The Great Wave off Kanagawa, particularly poignant. Hokusai, born in 1760 in Edo (now Tokyo), was a ukiyo-e painter and printmaker of the Edo period. Forced out of retirement after a long career by a grandson who gambled away all of his money, Hokusai went on to produce the work for which he is best known, his woodblock print series, Thirty-six Views of Mount Fuji. 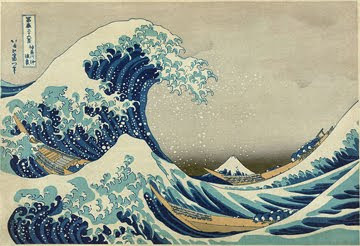 The series includes the iconic print, The Great Wave, which is the subject of this documentary. In another BBC production, contemporary artist Yayoi Kusama brings us from 19th century Japan to 21st. Often called the "Queen of Polka Dots" Kusama was born in Japan in 1929. At age 27 she left Japan for New York City and soon established herself as a leader in the avant-garde movement. Having suffered from mental health issues most of her life, she returned to Tokyo in 1973. Today, she lives, by choice, in a mental hospital, where she has continued to produce work since her return to Tokyo. In 2006, Kusama became the first Japanese woman to receive the prestigious Praemium Imperiale for internationally recognized artists. A reader wrote in about Art Authority, the iPad app I reviewed last week, asking me what an iPad had to do with art. I think it was more of an awkward attempt to make a statement on technology than a question, so I thought he might prefer this low-tech version of the iPad. Hokusai has been a guiding inspiration to me for the last several years. He continued to work ad grow into old age for it was essential for him financially - also - the challenge of "growing" as an Artist remained with him through his 89 years. A more complete explanation for his deathbed statement was written by him in the Colophon to "36 Views of Mount Fuji" which contained the "Big Wave" as one of its images. He wrote: "...At seventy three years I partly understood the structure of animals, birds, insects and fishes, and the life of grasses and plants. And also at eighty-one I shall progress further, at ninety I shall even further penetrate their first secret meaning, and by one hundred I shall perhaps have reached the level of marvelous and divine. When I am one hundred and ten, each dot, each line will possess a life of its own. ...". In his last years - he made a drawing each morning as he awoke. He was and is the perfect role model for the aging Artist. Thank you so much for posting this video clip from the BEEB. I was at the Norton Simon Museum on the day of the recent Japanese earthquake and tsunami. In the book shop are several items with reproductions of Hokusai's "The Great Wave." For the first time, I was grief struck upon looking at this image. For me, it had always seemed a fanciful image with those cartoon-like fingers, as the gent on the BBC documentary points out. But while I stood in the book shop at the Norton Simon Museum, knowing that thousands of people in Japan were desperately searching for their missing loved ones, my heart cried. "The Great Wave" is forever changed for me. As an artist with a lifelong love of Hokusai's Views of Mount Fuji, which I'd received as a gift book in childhood, I visited the Hokusai Museum in Obuse town, Nagano prefecture, last autumn. I found that the wave image must have affected Hokusai himself profoundly, because the museum had two of his original paintings on wood of waves, which were more abstract, that is, they were not part of a landscape. What is more, that wave image is cast in the manhole covers throughout Obuse town. What I did not expect was the huge number of paintings of violent battles. I knew that Hokusai's drawings of people had a lot of character, but somehow I had not expected that he would portray so many brandishing weapons. Another surprise was that he was not at all famous when he was alive. He was voluntarily homeless for most of his life, wandering and making drawings. At the end of his life, a rich patron built Hokusai a tiny cottage in his compound in Obuse. Alicia...I love your description - "The Wave" cast in the manhole covers - how wonderful! Hokusai is one of the "fathers" of Manga - probably the first - so he spent much time perfecting his drawings of the human form in exaggerated positions such as battles (not unlike Leonardo). Incredible man. And - yes - I have heard that he lived 100 different places in his life - also - he took - I believe - 5 different names in his lifetime (not an uncommon practice).